POPMONSTER: GREG POPE: HITTING THE ROAD THIS SUMMER! HITTING THE ROAD THIS SUMMER! MELLOW MUSHROOM, Live on the square in downtown Franklin, Tn! For two very special evenings in June, we'll be filling in for my son Asher's band, the Wacky Friday at the downtown Franklin Mellow Mushroom. We will not only be doing the anthemic original rock you're used to but also some GREAT cover tunes from the likes of QUEEN, THE POLICE, and ELO just to name a few. NO cover charge! NO excuses! JOIN US!! ONLY 50 TICKETS AVAILABLE! ADVANCE/ONLINE TICKET SALES ONLY—NO TICKETS AVAILABLE AT THE DOOR. We’re thrilled to be playing the premiere vintage guitar haven of the southeast! Due to the size of the venue and intimate nature of this performance there are only 50 tickets available and they must be purchased online in advance. Tickets on sale soon!! Check Heyday Guitars Facebook page for more info. Advance tickets: $10, Doors open 7:30pm. Show starts 8pm. 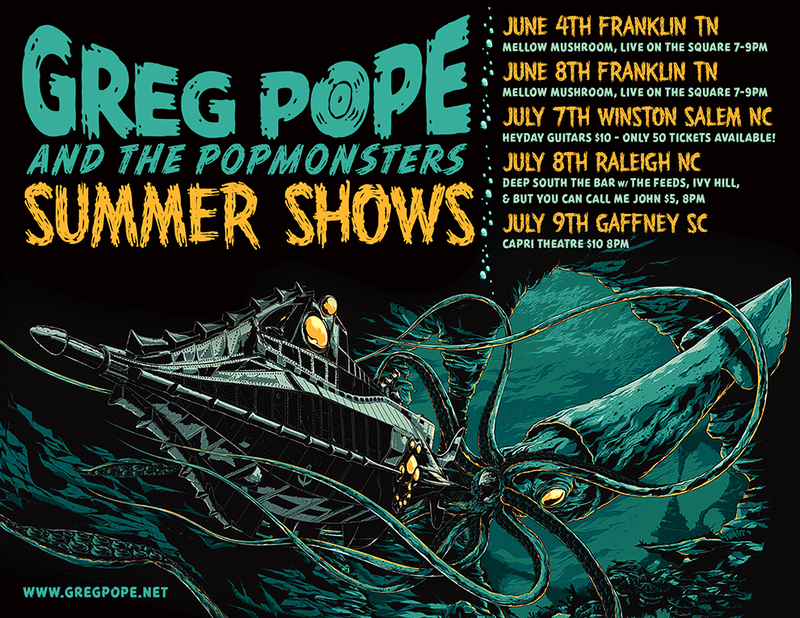 The Popmonsters return to the triangle! Joining us at Deep South the Bar is one of my former bandmates and favorite songwriters Will Marley and his band THE FEEDS, along with IVY HILL and BUT YOU CAN CALL ME JOHN. A full night of amazing music not to be missed! "FANBOY is another tour de force"
"Will grab you from the get-go"
"won't leave your head for hours after the first listen." "The pope of power pop"
"...Pope puts on his Monster Suit for Halloween..."